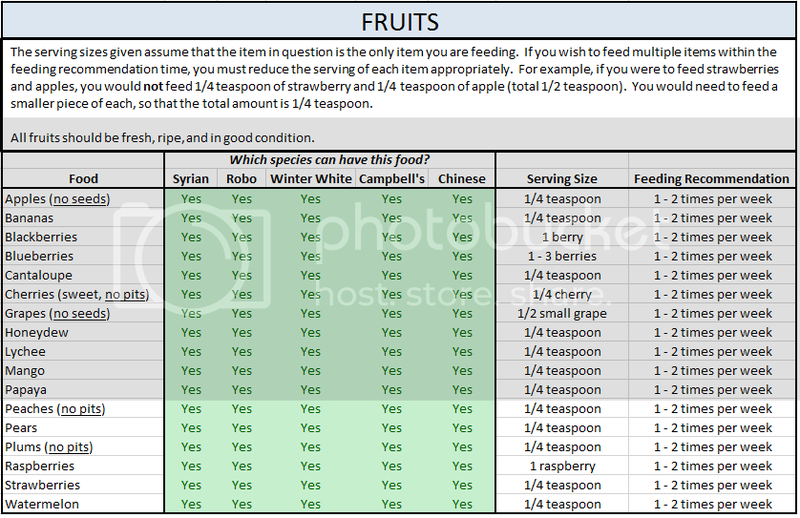 Note: Feeding recommendation for all the fruits mentioned above should be only once or maybe twice a week and not more. The serving sizes displayed are given assuming that it is the only fruit being given in the diet. If multiple fruits are to be added into the diet, then appropriate adjustments are to be made in the serving sizes. For example: If apple and grapes are to be fed then it should be so adjusted that the total quantity of apple and grapes being given to the hamster is 1/4 teaspoon. Note: The first 10 seeds of the list can be either fed dry or can be mixed into the daily diet of the hamster. 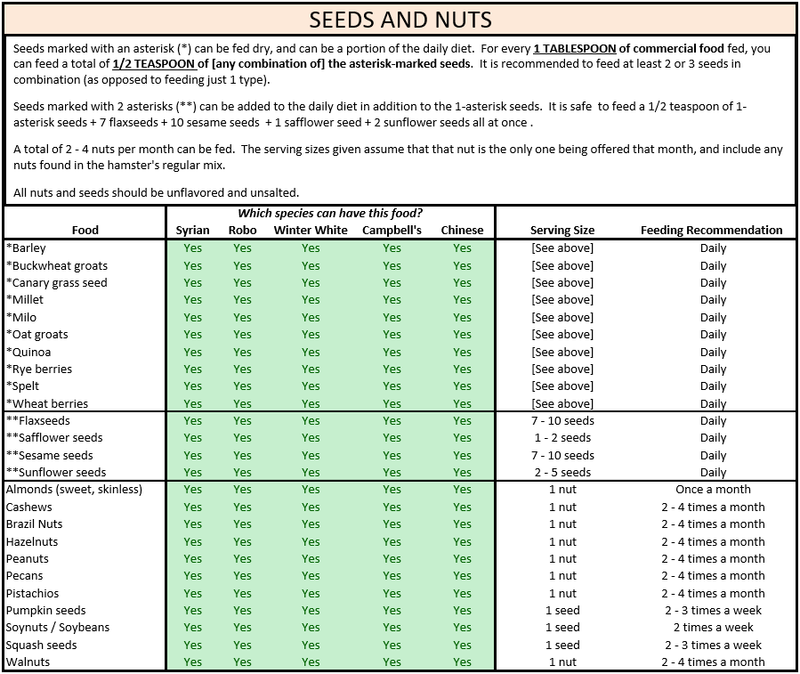 It is always advisable to feed 2-3 types of seeds in a combination for holistic nutritional growth. A total of 2-4 nuts can be fed per month and the servings are given after assuming that, that is the only seed being given in that particular month. And another important fact is that all seeds should be unflavoured and unsalted. Note: One may serve any of the above vegetables every other day but the serving size should not exceed 2 nickel-sized pieces. The serving sizes that have been provided are under the presumption that it is the only item that is being fed to the hamster. If multiple items are to be fed and added into the diet of the hamster then appropriate reductions and modifications in the serving sizes need to be made. For example, if broccoli and bell peppers are to be fed together, then, instead of 2 pieces of each 1 piece of bell pepper and 1 piece of broccoli is to be given. 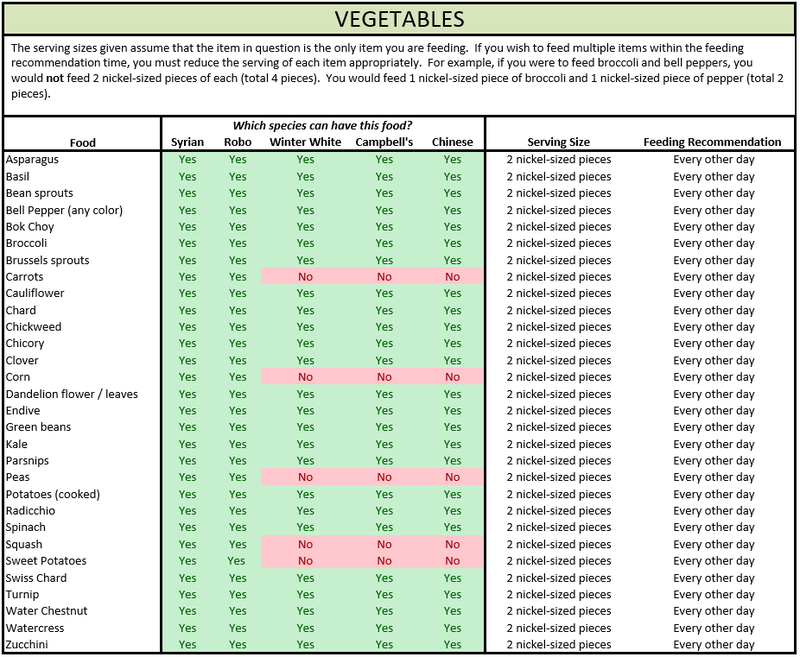 In addition to what is listed in the “Hamster Diet Chart” list, you should refer to each hamster food item here.